At first, it was hard to determine how to take advantage of the many functions the T6 has to offer. Thanks to Suunto's brief and poorly organized instructional manual, I had to figure out how to fully access most of the features of the watch myself. 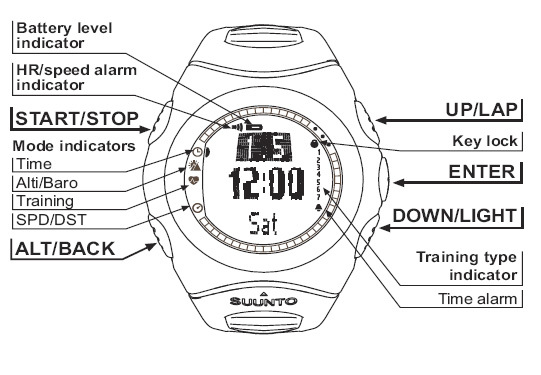 And while its commendable that Suunto produced a menu in eight different languages, the vagueness and painful conciseness of the instructions left me wondering why Suunto didn't spend a little more time developing a friendly and more thorough manual for such a complex device. Even so, the T6's easy-to-navigate menu system only took a few minutes to get used to. The two peripheral buttons on the right navigate up and down the menu to access specialized screens: training, altitude/barometer and time. The center button with the Suunto logo serves as the enter key. On the left side, the start/stop button is used during training and in the stopwatch function of the device (holding the button activates the stop). 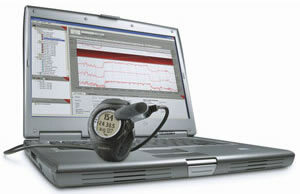 The alt/back button serves to change shortcuts and to connect to a wireless transmitter (i.e. heart rate belt, pods). 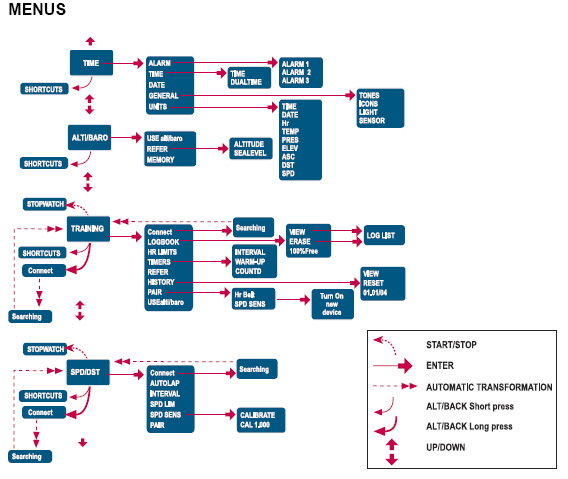 Below is a map of button functions taken from the T6 manual. Below is an in-depth summary of menu functions and the key combinations required to access them, taken directly from the T6 instruction manual. Confused? It is a little bit overwhelming at first, but the above map is a helpful reference point down the line as it encompasses every menu screen the T6 is capable of displaying. 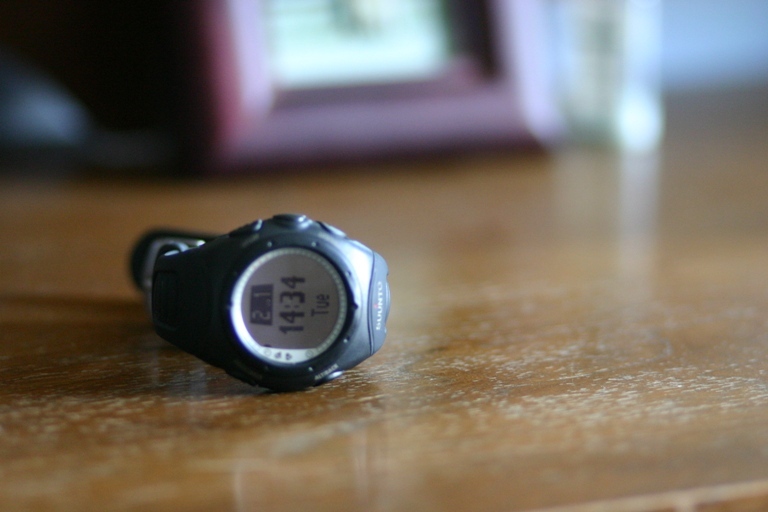 But what the T6 is really all about is its heart rate monitoring abilities. Here is where the T6 truly shines. After strapping on the transmitter and connecting, the T6 behaves very much like any other heart rate monitor out there. Besides the customary HR data, it displays other useful information such as such as altitude, air pressure, distance, and lap splits. It stores all of this information to 128kb of system memory, enough for a weekend of hard workouts, but probably shy of an extended hiking trip or a week of PC-less training. But these are all functions other heart rate monitors offer as well. So what makes the T6 unique? The answer is the device's ability to calculate and analyse the time interval between two heartbeats, something called Excess Post-Exercise Oxygen Consumption (EPOC). 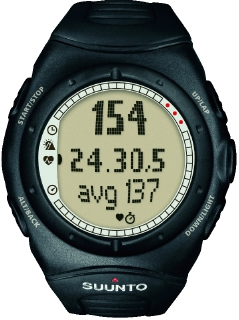 This relatively new set of information (which Suunto claims as extremely accurate) augments your typical heart rate data, and is used to calculate training loads and recovery efficiency. The graph data is then juxtaposed alongside heart rate after uploading statistics to Suunto's training program. It's all good up until this point, but unfortunately the bundled person training program leaves much to be desired. Even though there is a help section, the lack of a manual or tutorial is a serious frustration. 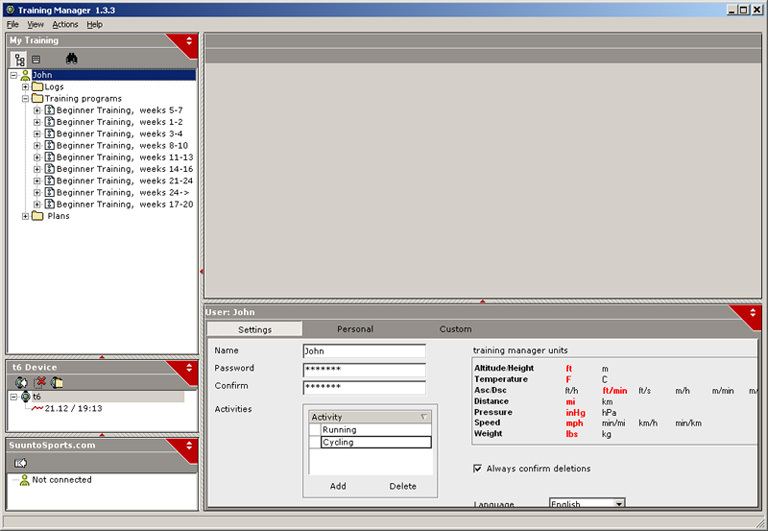 And that would be alright if the training manager were any semblance of user-friendly. Unfortunately, as has been the case with most of Suunto's hastily complied (at least that's what it seems) software, the program feels more like an alpha version than the final release of a "training manager" designed to compliment and excellent piece of hardware. Lest I seem too vicious with the software, I should concede that it does what it's supposed to do accurately and straightforwardly. After connecting the T6 to my PC, I can upload my workout data and read a variety of graphs stacked on top of each other representing my heart rate, EPOC, speed and altitude. But reading is one thing, accessing and manipulating is another. 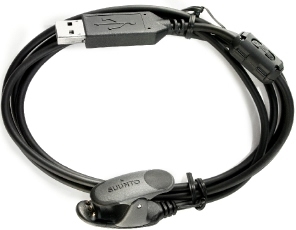 There's no dragging and dropping to speak of, and the data exports with Suunto's proprietary extension, making it useless to anyone without Suunto software. In the end, although it does its job, the spartan interface and stripped-down functionality of the training software simply just doesn't do justice to what the T6 package could potentially accomplish. 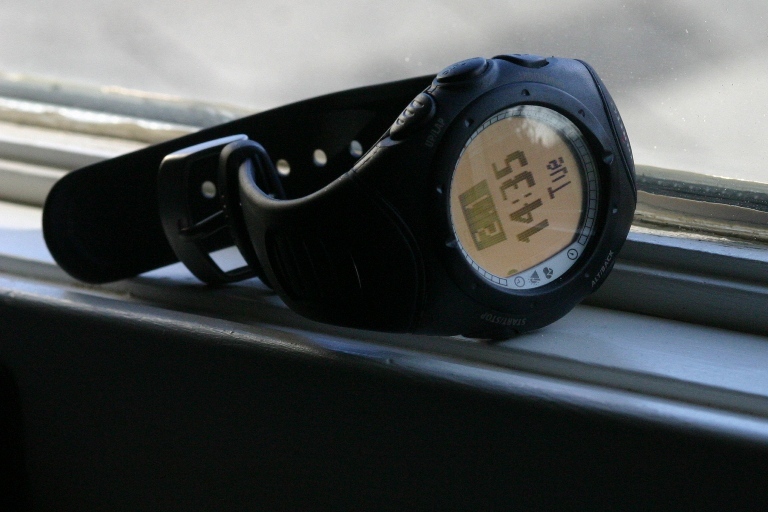 It's time Suunto invested a bit more in software development. Actually, it's been that time since the history of Suunto software.